Browse Quick Reference Content by Topic/Disorder. 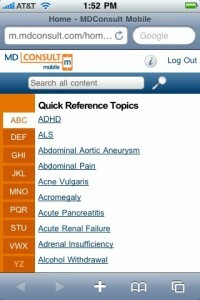 Search through the MD Consult content, including eBooks, Practice Guidelines, The Clinics, and Journals. Email citations to yourself or share links with colleagues. Instructions to access Mobile MD Consult. 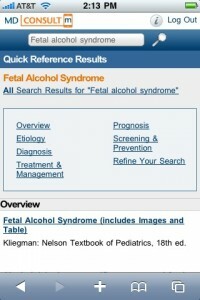 Start from the library’s home page: http://dml.georgetown.edu and click on Clinical Quick Reference. Then, click on MD Consult (http://dml.georgetown.edu/4115.html). If you are off-campus, you will need to authenticate with your Georgetown information. Then, on your device’s Web browser, open up http://www.mdconsult.com. This entry was posted on Tuesday, March 16th, 2010 at 4:29 pm and is filed under Databases, Resources, Technology. You can follow any responses to this entry through the RSS 2.0 feed. You can skip to the end and leave a response. Pinging is currently not allowed.